October | 2011 | Middle-Aged Woman (newly) On The Run! Before I get started with today’s Lesson From Running I would like to share that this morning’s run was an endurance/distance run and I finished 3.62 miles in 45 minutes. The past two days my husband and I have gone to the same gym at the same time and run side-by-side on identical treadmills. With the exception of running speed (he’s nearly eight inches taller than me so has a longer stride length/faster running speed) we’ve followed the same training methods. And really that’s what all my seeming ‘ambivalence’ towards my running and training since finishing my Graduation 5K back in September has been all about: Fear. The training program was so gradual and came so easily for me, and the results of that first 5K were so fulfilling I think I’ve been a little afraid to really push myself and then be met with some colossal failure. Which, of course, resulted in a disappointing result during my second race. I have given myself the ‘out’ of “I didn’t sleep well last night” or “I’m not feeling 100% today” at least every other running day for the past three weeks. When I’ve actually made it to the gym yes I’ve had A Plan and A Training Routine, but I’ve ‘cheaped out’ by following that routine at an easy, comfortable pace. Even today when I was forced to slow down by Ye Olde Side Stitch I somehow managed to “forget” to ramp my speed all the way back up to the pace I’d been running at before slowing down. Tomorrow is Hill Training and in keeping with the aforementioned intention to up my running speed and stop being afraid of failing at faster paces I’ll be following that training plan at a challenging 4.7 mph rather than a comfortable, ‘completely doable’ 4.2 and relish every twinge of the sore legs that will surely be the end result. Here’s to pain bringing gain! The past couple weeks haven’t exactly been banner weeks for me from a running perspective. The week of October 10th I got sidelined with some sort of bug that’s been going around down here in Dixie that alternates between intestinal disfortitude and nasal/throat/respiratory funk. So there was no running in my little Mudville that particular week. Last week (week of October 17th) I did manage to make it to the gym twice, but the fatigue factor of that bug was really kicking my tail. As has been the pattern with this little malaise I felt great Saturday, but we allowed ourselves to get “too busy” to have time to get a run in. I woke up Sunday and Monday both days feeling more fatigued and achy than any other major symptom, although the annoying sore throat part just doesn’t seem to want to go away. (No, it isn’t Strep. I know Strep when I have it.) However, this morning we did get to the gym and on the treadmills because the thought of not running another day bothered me more than the sore throat and tiredness. Today’s workout was speed training which, while fun in that “Oh my gosh I’ve never run that fast for that long ever in my life!” kinda way, but I had to keep reminding myself that today wasn’t about distance. Saturday – endurance outside on pavement. My hills workout is one I found online from Hal Higdon and is actually a full five mile run itself, but because the focus is hill training it’s done at a slow jog speed. And it will kick your behind! Well it kicks mine! So yes, I’m still running. Just got a little sidelined by illness. Oh, and before I go I have two words of advice: Compression. Shorts. Seriously the best money I’ve spent on running gear this side of good shoes and Thorlo® wicking socks! It should be against the law for anyone to run without a good pair of compression shorts on under whatever other running gear they choose. I am seriously in love with these things! And with those little (unpaid) product endorsements I leave you to your Tuesdays. I WILL be back tomorrow to report on the results of my effort to run five miles at a 4.6/4.7 mph pace without stopping. Last night I started doing intervals that are designed to increase my speed and decrease my overall race time. It went well and now that I’ve done the hill/endurance regimen and the speed/endurance regimen once each I can really see how this whole thing is going to come together. The current short-term goal is to finish our November 5th race at or under 35 minutes. The longer short-term goal is to finish the December 3rd at or under 30 minutes. The good news is I am beginning to get a feel for what I have to do in order to make that happen. The better good news is that I am now running my entire workouts without slowing down/stopping to walk. And the best good news is that this whole Runner’s Mindset is beginning to pervade other areas of my life. Just like I want to improve my time and performance in a race, I am finding myself increasingly discontent having to “stop and walk” in other areas of my life. I want to keep moving in everything. Just like I have learned that in running there is preparation necessary in many areas – gear, ‘fueling the machine’, adequate sleep, understanding the mechanics of what it takes to improve performance – I am finding myself less inclined to just “jump into things” without doing the homework and lining up the tools and resources necessary. Just like I have gone from “Oh, just running 5Ks is enough for me” to “I want to run a half marathon”, I am finding myself wanting to “up my game” in other involvements I have. I have had the thought, and said to other runners (other runners – I love saying that), numerous times that “Running is about more than just putting one foot in front of the other”. And it is. I can’t quite quantify what all that is at the moment, but I know it is so. Tonight I was That Woman on the Treadmill! For as long as I’ve been going to gyms I have hated . . . no I have resented . . . no I have envied those people (especially the women because I am one) who would come strolling into the gym, step confidently onto the treadmills, press “Quick Start” and just start running. They just R-A-N. And ran. And ran. Not for four or five minutes. Not for a few tenths of a mile whereupon they would slow down or stop and be gasping for breath and with relief, red-faced, sweating, and obviously ready to drop. They ran for half an hour, forty-five minutes, some even an hour. And they made it look fun, easy, even (dare I believe it?) enjoyable. Okay, I really did hate them even if only a little bit. Tonight I was That Woman! 1 mile at 1% incline. That adds up to a total of five miles. Since I had yet to run all of three miles I thought running five with the addition of inclines might be a little more than I needed to do so I eliminated the 4% incline half mile and the second 3% incline making the first one my “turn around” interval. That gave me a total distance of four miles. I ran that in right at 57 minutes and kept it at an easy speed of 4.2 mph. Although I did get a little bored with that pace and ran out the last 1/4 mile of the last interval at 4.6. My five minute cool down gave me just under another quarter mile. And at the end I felt pretty good! It ended up being a combination endurance and hill training. Really from now on all my training runs will have some aspect of endurance training to them, even the “easy” runs. Tomorrow we’re getting back into our early morning workout routine and since it will be only twelve hours after tonight’s run we’re doing weight/resistance training instead. Thursday will be a speed/endurance workout and Friday I’ll go back to hill/endurance training. Tonight’s Lesson Learned: Anti-chafe creams are mandatory when you are running longer distances. “longer distances” being defined as pretty much anything over two miles. 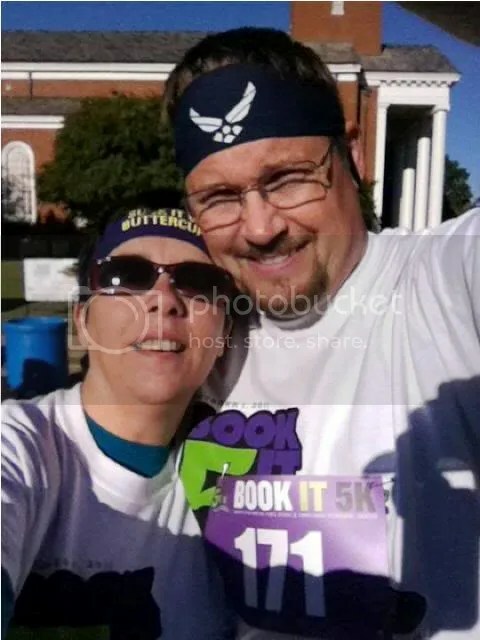 Yesterday my husband and I ran a 5K together. While not the first 5K we’ve participated in together it was the first time we both participated as runners. 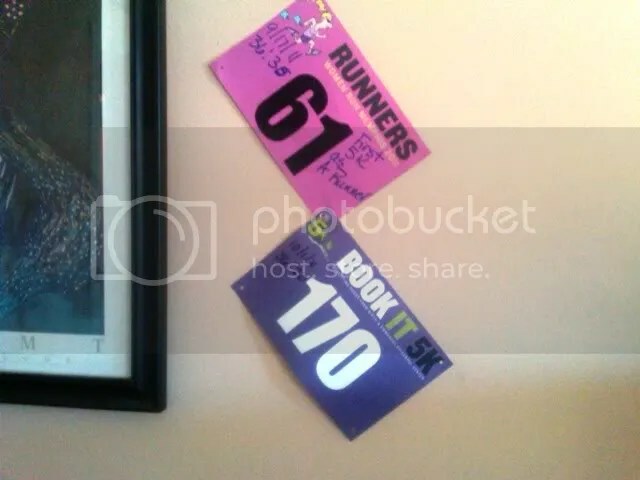 We started together, he finished four+ minutes ahead of me. And he finished with more than that under his belt. 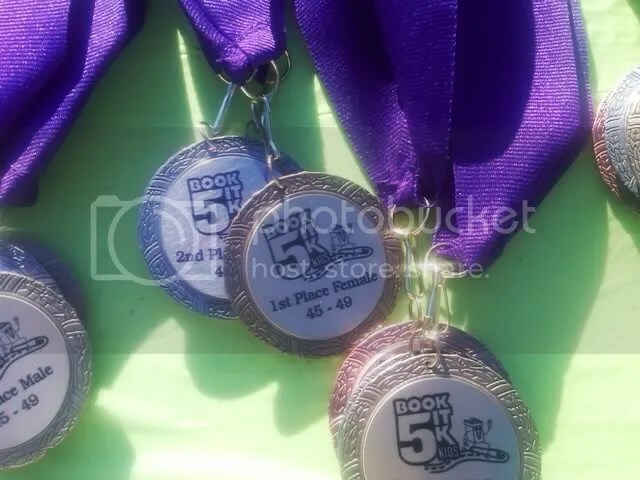 Third Place in the Men’s 45 – 49 Division! 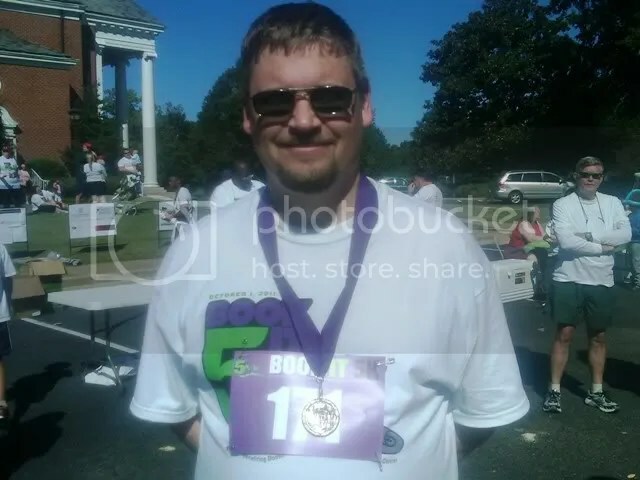 This was his first time running a 5K in over four years. I was/am so proud of him! I had an ugly run and I have no excuses for it. I simply did not put in the time and effort training in the two weeks since my first 5K to bring about any significant improvement. Oh, I managed to shave fifteen seconds off my time from my first 5K, and yes that was improvement and I appreciate and honor that. But the truth is, it could have been better. Part of that is the natural ‘let down’ after accomplishing a particular goal, and I understand that “human nature” aspect of the whole thing. Doesn’t have to be “First Place” but I definitely want to place. Rich: Do you mind my stated goal? Rich: Doing the Air Force Half Marathon? And then, I hear the following words falling out of my face as if they’ve been sitting there on the edge of my mouth just waiting for an opening: There’s no reason we can’t be ready for that in eleven months. Of course this little voice in the back of my brain immediately starts screaming (a la Tonto to The Lone Ranger) “What’s this *we* White Woman?! You have clearly lost your whole, entire, middle-aged, over-weight mind!” But she was immediately drowned out by talk of how I need to chane up my training regimen to increase my running speed as well as working hill training into running on a treadmill since we’ve shifted our workouts back into the gym in preparation for shorter days and inclement weather. And I haven’t heard her piping up since. I downloaded and printed the Runner’s World Magazine Half Marathon Training Guide and starting January 1 that’s the regimen we’ll be following. I may well have lost my whole, entire, middle-aged, over-weight mind; but I think that’s because it’s been replaced with a Runner’s Mind. And I am completely, 100%, a-okay with that! Get used to seeing pictures like this. “Frustration is the first step towards improvement. I have no incentive to improve if I’m content with what I can do and if I’m completely satisfied with my pace, distance and form as a runner.